Meet Art Kishiyama. 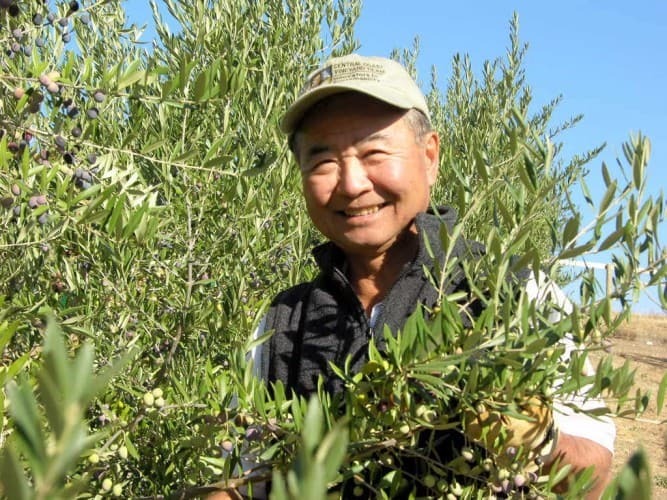 After 26 years in the air force and 15 years as a Walt Disney Imagineer, Art is now growing olives and producing olive oil in Paso Robles and enjoying his retirement as a California farmer! Find out what drew Art into farming! Art: I had a crew putting down 60 tons of road base. It’s been dry for so long that I’ve been parking my farm equipment and trailer just on an open field and with El Nino coming up I might be sunk up to my axels if it gets wet out there. I also took delivery of 90 cases of olive oil jugs that we package and ship bulk oil in to some of our commercial customers. I had that loaded at the front-end loader of my tractor and was stacking it at my storage facility. I was also doing odds and ends around the farm getting ready for tomorrow where I will be doing some weed control. Other than that it’s just a normal day, a very busy day on the farm. That’s especially noteworthy since I’m supposed to be retired. Art: I’m not sure I have a favorite thing. I know definitely when I started that it’s so different than my professional career. I never dreamed in a million years that I’d be a farmer. In fact when I went to Cal Poly it was known as an agricultural school and I had to pick a major when I registered and agriculture was right at the top of all the majors and one thing I was certain about was I didn’t want to be a farmer. The next ‘A’ major down the list was architecture and I thought that sounded good. And so I chose architecture. I did in fact graduate with a degree in architectural engineering. The engineering degree took me to world miles away from farming. Farming is outdoors; my professional career was mainly inside an office environment. But being outdoors is what I love most. Farming is way more complicated than most people realize. I think the science of farming; the whole business of plant biology and soil nutrition and being a good sustainer of the environment makes it quite the intellectual challenge that I didn’t quite anticipate. Because I’ve always had an inquisitive mind and always need to be intellectually stimulated, learning how to farm has been a challenge and I’ve had plenty of places to learn new things. I really enjoy that. I think everyday I find out more that I didn’t know about what I’ve been doing. The amount of knowledge you can accumulate to farm is limitless. I think the challenge of doing different things with farming is what intrigues me the most. And what I’ve never done before is create a brand. And to market that brand and get positive feedback about my product, I think that’s what is most rewarding. So I don’t have one favorite thing, but multiple things. Art: There’s a couple of ways. We give money to the community, mostly to charities that support the homeless. My wife Lynn and I give financial support to battered women shelters. On a larger perspective I’m Japanese American and my parents were interned during World War II. They sacrificed a tremendous amount for me to live the way I am and have the life that I’ve had so in reverence to their memory I’ve sent a lot of money to organizations that preserve the legacy of Japanese Americans. Locally, part of sustainable agriculture is sustaining our community. I make it a point to always pay more than minimum wage to our farm workers. It helps me a lot because by creating a very friendly work environment we get good productivity from our employees and more importantly we see the same people coming back year after year. Taking care of our farm workers is a very important part of our farming. Art: Strictly by accident, when I started planning to retire from Walt Disney Imagineering I had been on one heck of an adventure. We had just finished Tokyo Disney. I spent 15 years building international theme parks. Before that I was in the Army, I graduated from Cal Poly in architecture, when I graduated they were drafting. I was certain that I was going to be drafted and go straight to Vietnam immediately after college and to avoid that I joined the air force. I spent 26 years in the air force. Forgetting my original objective was to avoid the army and Vietnam, I ended up in Vietnam anyway. It turned out to be a 26-year military career that I have no regrets about; I retired as a full colonel. I retired from the air force at the age of 48. At the peak of my career I could’ve gone to work for anybody at the time. That’s when I bumped into Walt Disney Imagineering they were about to start what they called then the Disney decade, an initiative to go international. At that time Paris Disneyland was under construction and they were already planning the second park, they hired me to lead the team to finish the second park. That’s how I got into Disney and I ended up doing Disney Tokyo instead. For me it was 15 years of very hard work, very complicated work. We had a place in Mammoth at the time and we thought we’d get another place on the ocean. As we traveled up the coast we were never happy with anything. It turns out the coast was a lot like the big city, with the houses all packed in side by side. It was no different than being in the city, just with a view. We were encouraged by some friends to look more towards the Paso Robles area. We were flabbergasted by what we found, space, privacy and beautiful rolling hills. At that time many were vineyards. We got attracted to this area, which is an agricultural area, here in Pismo County. We bought this beautiful home, about 20 acres with nothing on it. It took us about a year but we got into olives. It was more by accident, we came out here fell in love with the area, we fell in love with the house and the setting and I had 20 acres to work with nothing on it. I thought that would keep me busy during retirement. That’s how we got into farming, totally by accident just like the air force and just like Disney. Art: Air streaming, I bought my first airstream because I found after 2 or 3 years of working on the farm during my retirement I’d gone fishing once and played golf once. I did more of that when I was working. I said there’s something wrong with this picture. The only way to take a break from the farm is to get away and get off the farm. So I hook up the airstream to the back of my truck and I can be in Yosemite in a few hours or on the beautiful coastline in a few hours. So I pack up, hug my wife goodbye, pet my dog goodbye, and take off all by myself for 2 or 3 days. The whole idea is to get away from the farm so I try to do that 2 or 3 days every month. I do fish on those air-streaming trips; we fish the Eastern Sierras every year. This summer I’m going to shut down the farm and my wife and I are going to head to Alaska in the airstream for 12 weeks. It’s going to be the ultimate road trip. Art: What I didn’t tell you is that when I planted my olive trees I tried to get advice on the olive oil business. There were very few people here, maybe 2 or 3 olive farms so I had to learn most of my farming from grape growers. They would share their techniques and the more I listened to them the more I appreciated that farming is farming. Many of the techniques these grape growers were talking about were universal. Now I get that question a lot being the president of the Central Coast Olive Growers Association. And I first ask them, well what’s your objective and more often than not they tended to be people like myself, older, approaching retirement, a small piece of property that somehow wanted to monetize. I’d tell them well if your objective is the money I wouldn’t do olives. In fact I wouldn’t plant a thing. Farming is a lot of work. I’d tell them do it for the passion, for the love of it; you cannot do it for the money on a small scale. Make sure you understand your objective. If you have the passion to grow things and to give back to your community in that way then by all means do it but don’t expect to get wealthy. Do it for the passion and for the love of it. It’s a labor of love not work.